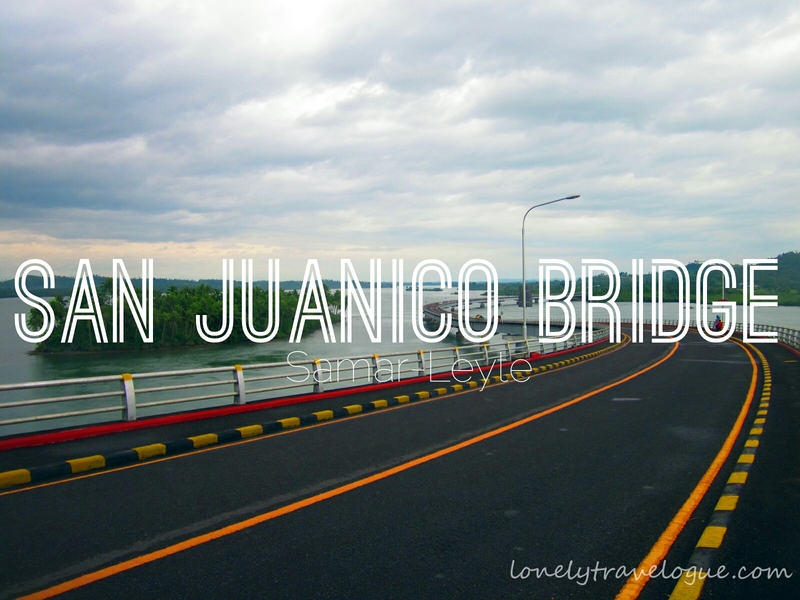 San Juanico bridge is one of the most beautiful bridge in the Philippines. No doubt. I remember way back in grade school, grade one specifically, my favorite subjects was Sibika at Kultura. It tackles everything about the Philippines like geography, history, landmarks, culture and the like. I was good then in this subject proud to say. I know every region, provinces its corresponding capital, and every landmark in our country. It was the subject I really love until today. The subject allowed me to travel in time as well as to different parts of our country. I love looking at the of my black and white thick books. It made me dream of visiting these places one day like what I am doing right now. The places like the Banaue Rice Terraces of the Mountain Province, Chocolate Hills of Bohol, the Vinta of Zamboanga are some of the places that I long to see when I was in grade school that I just visited for the past three years right after college. Just last, one of my dream came true when I was able to see an engineering wonder of the 1960's - The San Juanico Bridge in Tacloban, Leyte. Bridges are meant to establish relationship among people. Its like veins that connects two separate islands and sometimes hill or mountain. Thus San Juanico Bridge is meant to connect Leyte not just in Samar but to the rest of the Philippine archipelago. It may involve some political agenda then but the fact that this bridge is functioning everything that stains it vanishes. I went here out of boredom. While the rest of the buddies were enjoying the Pintados Festival, I went out to see the city. Fortunately, another friend was also in the city and the moment I learned that she was doing nothing except that she's eating, I immediately asked her if she want to go to the San Juanico Bridge. After all no one in our group seems to like to go the bridge since most if not all have already seen the bridge. Shuga and I met at the back of the market and took the full packed jeep bound to the bridge. It was the first time Shuga and I met but the blood of a backpacker connected us. I thought the jeep we took will cross the bridge. Half dismayed we jump on the last barangay or the Leyte side of the bridge. I wanted to walk on the San Juanico Bridge but not on the Leyte side. 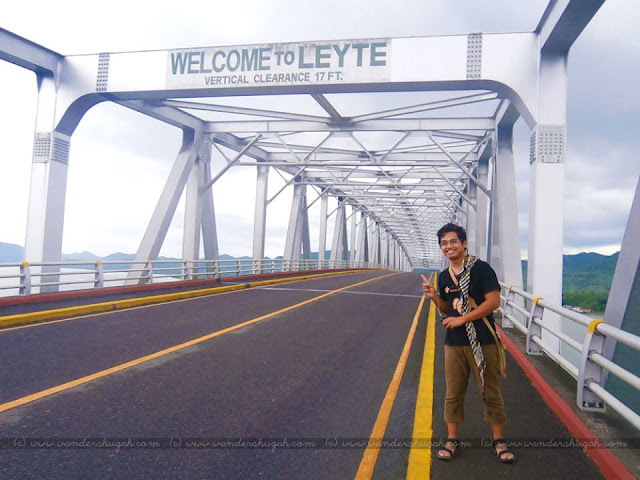 My plan was to go down on the Samar side of San Juanico bridge and begin walking there going to Leyte side. But we did the walking the other way around. I realized that what happened is much better as the buses going back to Tacloban are already full after it crossed the bridge from Samar side to Leyte side. Actually it was full when we took the bus at the Samar side. So things worked for us. I wanted to cross the San Jaunico Bridge by foot. But I was a little anxious to continue because I was with somebody and not just somebody but with a woman. Even though she already told me that its alright with her to walk I still feel a little worried because the bridge is more than 2 kilometers. Maybe I was too gentle on her on my mind or am I underestimating her? Hmmm... whatever it maybe the thing was we made it to the otherside!!! San Juanico bridge is so beautiful. The pictures on my black and white grade school textbook cannot justify the bridge itself. No wonder it is a major tourist attraction in Leyte. Its quite an emotional and a happy moment for me. San Juanico Bridge is a gigantic piece of art. My teacher said that San Juanico Bridge froms an S and L signifying Samar and Leyte. Its not a perfect S and L but it has a little resemblance of those letters. The view surrounding San Juanico Bridge is spectacular. The 40 meter high steel bridge allows you to sea the magnificent view of San Juanico Strait and the islets surrounding the bridge. The bridge is a perfect place to think and to appreciate nature especially the sunset and sunrise. One problem I got when I was on the bridge was my knees were shaking whenever there were vehicles that passes by. The bridge would shake strong enough for you to feel an earthquake. And being on the side of the bridge or the pedestrian will really gives you a chill. I am not afraid of heights , I think. Ok. I'm kinda afraid but I always face it and conquer it. But every time I am faced with it my nerves are cracking like a petrified man hammered to death. I notice that vehicles crossing the bridge were not stopping. They say that when vehicles stops while on the bridge would cause damage to it. I guess there would be more shaking when the cars especially the buses and truck stops thus, maybe weakens its foundation. I am not an expert. I am just using normal human reason why vehicles can's stop on the bridge. I pray that this 40 years old bridge would last many generation so that kids, just like me then who dreams of seeing the bridge will not be shattered. Take any bus, jeep or Van bound to Samar. Travel time is 20-30 minutes. Where to Go (Hotels) in Tacloban?